SYNTHESIS: A systematic debunking of the myth that success is mostly determined by talent and hard-work – with quantitative and qualitative evidence from medicine, sport, business, history, music, science and more – by journalist and author, Malcolm Gladwell. What we did: Preparation, decisions. But the idea that the best rise to the top because they are naturally better and brighter is simplistic. In reality, many, interacting and compounding drivers set the odds of success. Some factors, steps and decisions are within our awareness and control. Many more are beyond them. And coming to terms with this reality is an essential part of increasing equality, opportunities and outcomes for all. Proving this thesis doesn’t need a full competing theory. It simply needs to disprove the self-deterministic incumbent. 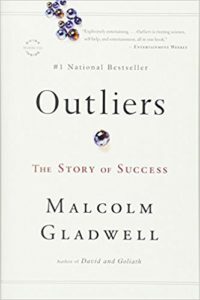 This is the task Gladwell takes on in Outliers – drawing on medicine, sport, business, history, music, science and his own life to illustrate the true complexity of success. The effects of language in making it easier or harder to learn (e.g., Chinese number systems and mathematics). Gladwell’s conclusion? The self-made-success template fails across many domains. And even factors that we might think of as in our control (e.g., character and practice) are often much more dependent on opportunity and legacy than we realise. What truly distinguishes success stories from stories you’ve never heard isn’t extraordinary talent – it’s extraordinary opportunities. Our brains just can’t factor everything in – We aren’t able to visualise compound results of many causes working together, at once or over time. But simplifying forces narrative fallacy – Story-telling forces us to pick a single, linear line of causality through complex and non-linear systems. And when we do, we suffer from self-serving bias – Given the choice, we naturally store, recall and overweight factors we control to explain success. Improving it for us all. So, take the success stories of others with a pinch of salt. Be aware of creating, endorsing or falling on the wrong side of systems that distribute opportunity unfairly. And remember, much more of success than you realise is neither deserved nor earned. N.B., Like all of Gladwell’s writing this is wonderfully researched and full of illustrative stories and evidence. Outliers is a book I need and want to come back to for a full crunch – if you haven’t yet, it’s well worth a read. Like the gist of what we’ve covered here? Check out this crunch of Matthew Syed’s Bounce and Gladwell’s fascinating podcast Revisionist History.